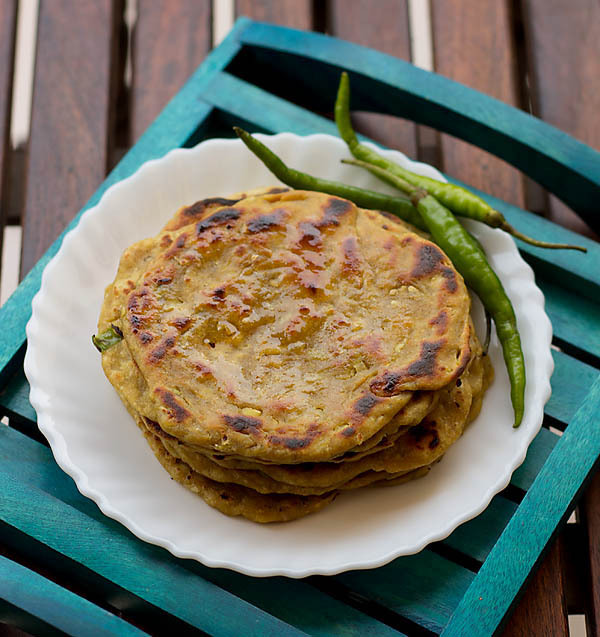 Easy Lauki Paratha recipe – made with fresh bottle-gourd (lauki), spices and whole wheat flour. This is simple yet healthy, flavorful also an ideal snack for lunch box or breakfast. I usually make lauki paratha for my husband snack box. 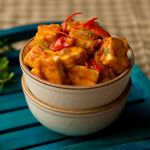 Club them along chutney, sauce or dry garlic chutney and you are set. Otherwise it’s a big fuss to make them eat bottlegourd, fenugreek leaves or spinach. 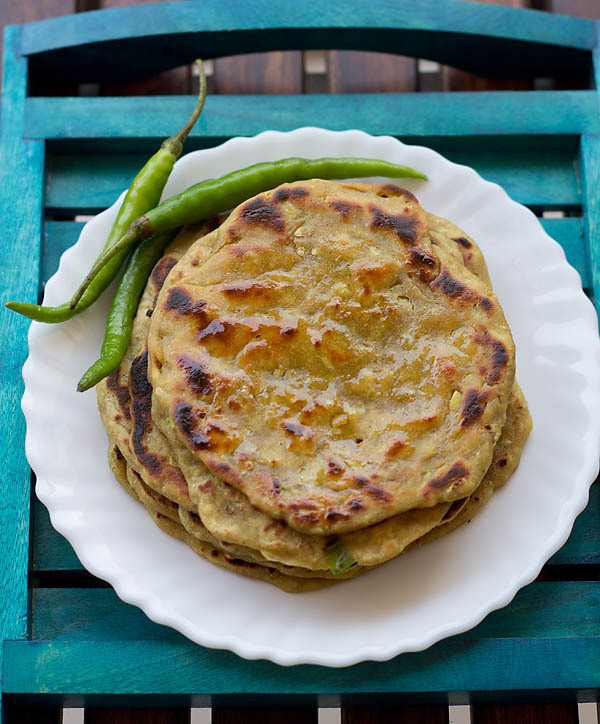 This is the best way to club veggies in parathas as they happily like them and eat them. As a wife or mother you also get the satisfaction of seeing them eating veggies. Guess this runs across all family where one specimen or example would always be there of not eating leafy veggies. Hmmm so we keep coming up with novice ideas like these and so is is all women who run their household. Similarly you could use pumpkin, cabbage etc in this recipe. Either you could make theplas or parathas. 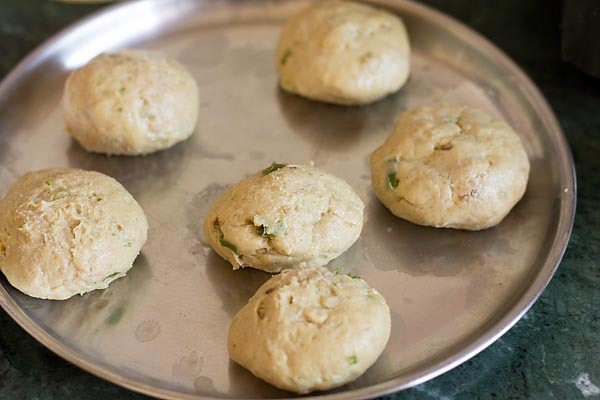 Theplas differ in the preparation as they also consist curd, gram flour etc. 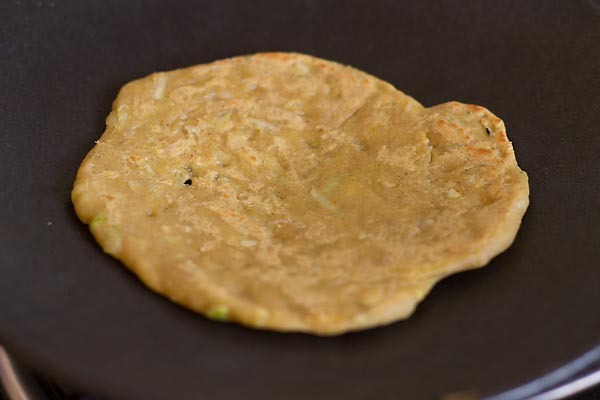 You could check methi thepla recipe here. Blessed to be in India as one get to taste vivid food and different flavors. Even across all household’s many different regional cuisines are cooked. So feel luck to be born here to see and experience so many varieties of food. Just take care while kneading the dough don’t add excess water. As bottlegourd will leave it’s own moisture so adding water would make the dough sticky and non manageable. Rinse the bottlegourd and wipe with a cloth. Peel the bottle-gourd. 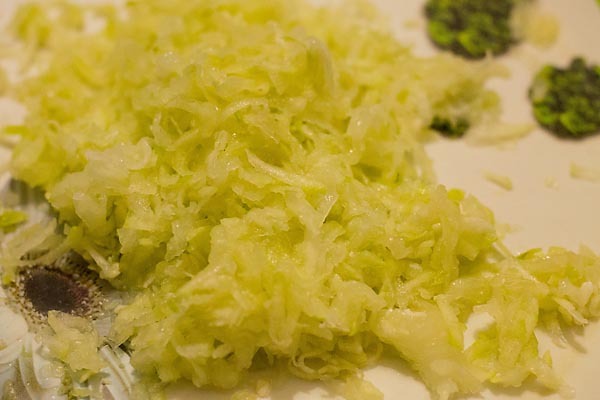 Grate the bottle-gourd and place aside for 5-10 mins. As they would start leaving moisture. 2. 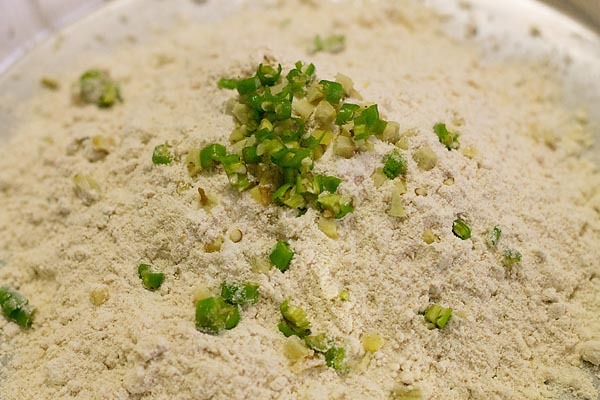 Combine whole wheat flour, spices, ginger, chilies and salt. 4. 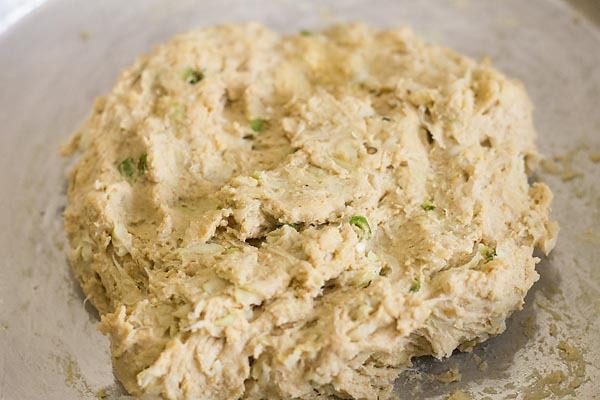 Start kneading the dough and there is no need to add water. 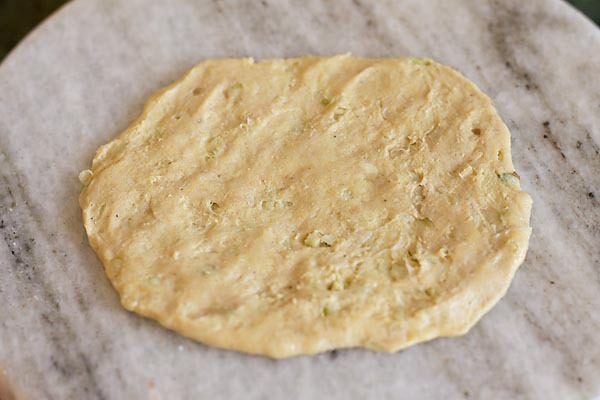 As the moisture of bottle-gourd is enough for the dough. Place aside for 5 mins. If they look sticky then add some more flour. 5. Shape into small balls. 6. You could roll them with a pin roller by dusting some flour. Alternatively you could shape them round with the help of your hand or finger. 7. Place the parathas on hot pan or iron pan. 8. After 30 secs flip them and cook other side on medium to high heat. 9. Once you start seeing the brown spec or dots. 10. Smear some drops of ghee over the edges. 11. I generally press with a cloth or masher so the sides cook evenly. 12. Once they cook and appear golden brown from both sides. Remove and place them in a casserole. 13. Repeat the same with the rest of dough. 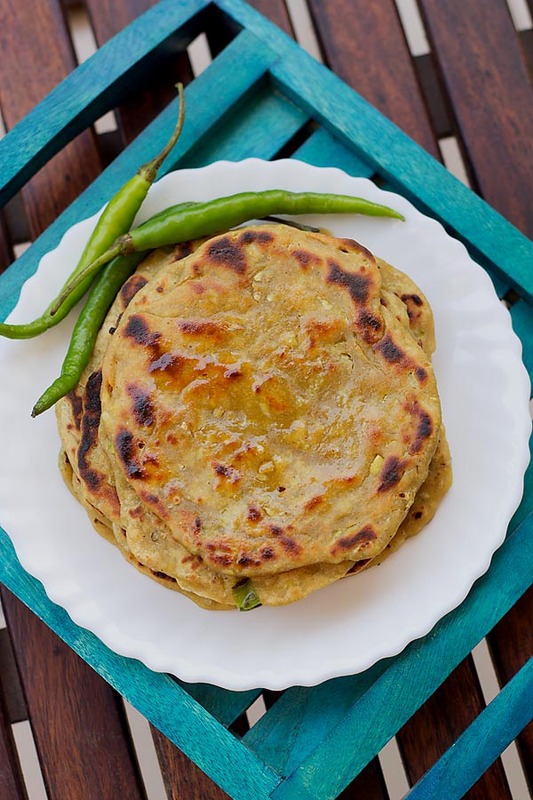 Serve your lauki parathas hot with chutney, pickle, salad or curd. 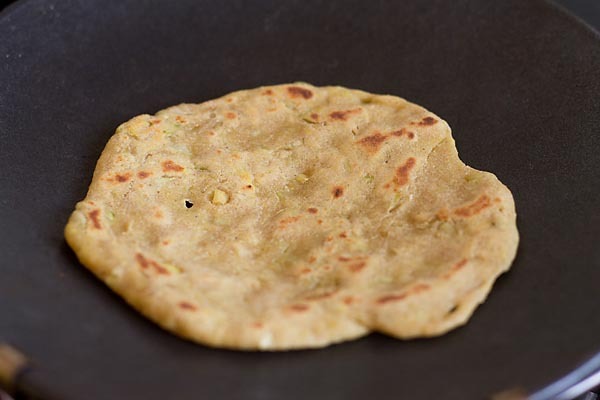 If you are looking for more parathas then do check aloo paratha, sprouts paratha, chocolate paratha, cabbage paratha, palak laccha paratha, chicken keema paratha and palak paneer paratha. 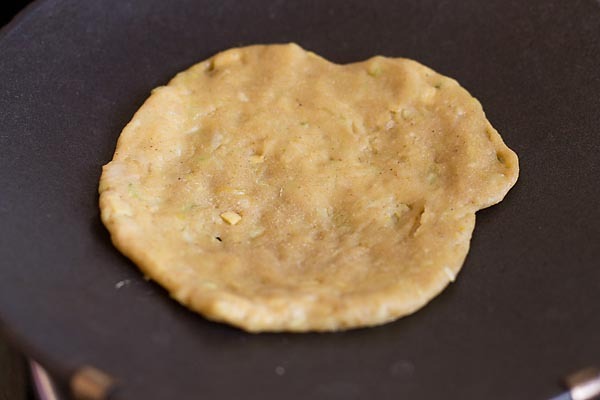 Easy Lauki Paratha recipe - made with fresh bottle-gourd (lauki), spices and whole wheat flour. Grate the bottle-gourd and place aside for 5-10 mins. As they would start leaving moisture. Combine whole wheat flour, spices, ginger, chilies and salt. Start kneading the dough and there is no need to add water. 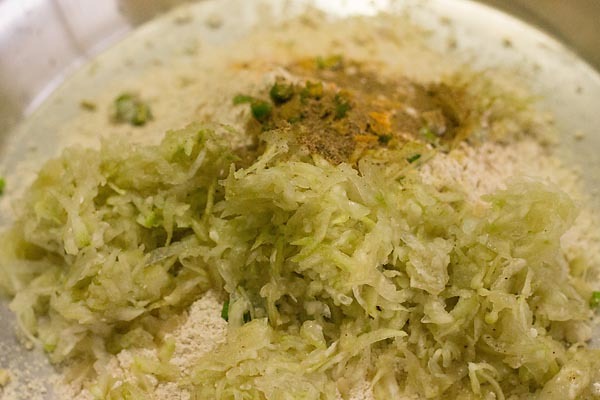 As the moisture of bottle-gourd is enough for the dough. Place aside for 5 mins. If they look sticky then add some more flour. You could roll them with a pin roller by dusting some flour. Alternatively you could shape them round with the help of your hand or finger. Place the parathas on hot pan or iron pan. After 30 secs flip them and cook other side on medium to high heat. Once you start seeing the brown spec or dots. 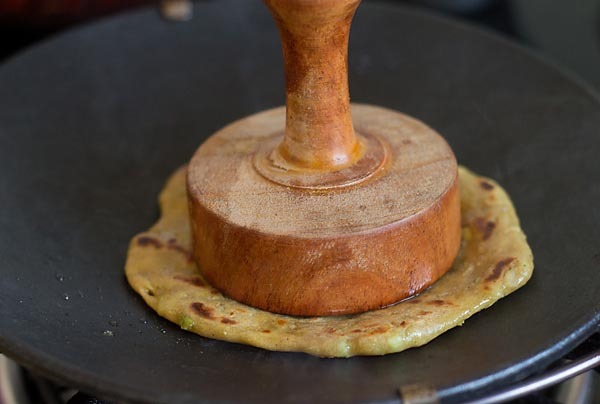 Smear some drops of ghee over the edges. I generally press with a cloth or masher so the sides cook evenly. Once they cook and appear golden brown from both sides. Remove and place them in a casserole. Repeat the same with the rest of dough. 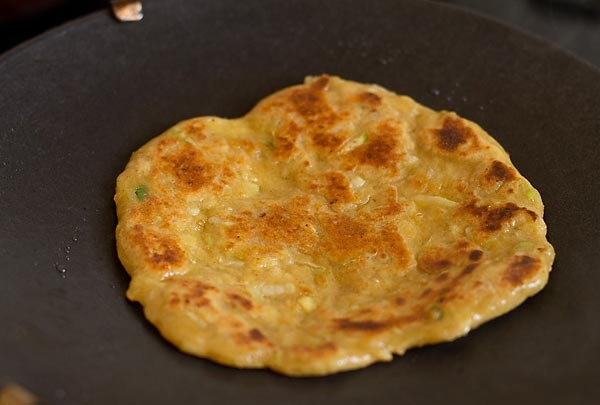 Serve your lauki parathas hot with chutney, pickle, salad or curd. 1. Always cook parathas over high heat for the crunch effect. 2. Alter spices as per your preference. Loved it! Perfect for a snowy day! Tried out the parathas. My kids loved it. Thanks.. Pleased to know this Amy you are welcome. Made them twice in two weeks now. They are delicious and healthy too. Makes for a nice lunchbox. Keep posting new recipes, love your blog and have bookmarked some recipes, will try all of them now i know that they are worth trying. very healthy snack make the very often for my kids but writing now thanks.